Liquid liner makes a great statement on eyes, but not all women have an easy go of it. Most ladies spend more time cleaning up their liquid lining disasters just to go back to their easy to handle pencils. There is hope for all of us who do want to define our lash lines with precision and ease. If you are a lining pro stay with your favorite old school liquid liners but for those of us who need a little more help try the pen versions. They are so much easier to control and draw on perfect lines in a flash. 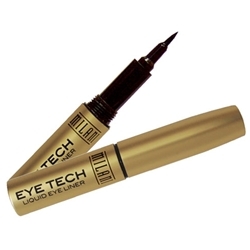 My new favorite one is the Milani Eye Tech Liquid Liner that comes in Black, Brown or Charcoal. The great $6.99 drugstore price is an added bonus because by far this pen is the best I have ever tried and trust me I have tried them all. The right way to apply it is to hold a mirror up to your eyes and peer down at it. Then start at the inner corners and place the pen at the roots of the lashes and begin sweeping along the upper lash line working your way outwards and wing it a bit out at the ends. If the wing does not look perfect use a small-tipped concealer brush to erase any smudges and clean up the wing. Take a beat and let the liner dry before applying any mascara. Never use liquid liner on the lower lash line as this will look too harsh instead take an angle brush and dip it into a little powder shadow then smudge lightly. Now you are the master of definition!